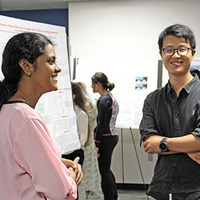 The 2019 Spring Computer Science Poster & Demo Day event provides an opportunity for both undergraduate and graduate CS students to present and demonstrate their latest research and development work. Come and see the many exciting projects from various groups within the Department of Computer Science. Snacks and drinks will be provided. This event is sponsored by the Department of Computer Science, the GSU student chapter of the ACM, and the GSU student branch of the IEEE.